Otis likes to take off alone, and he knows his way around town. Sometimes, he goes to the local Dairy Queen, where someone gives him some ice cream or hamburger, Salvador Segovia said. 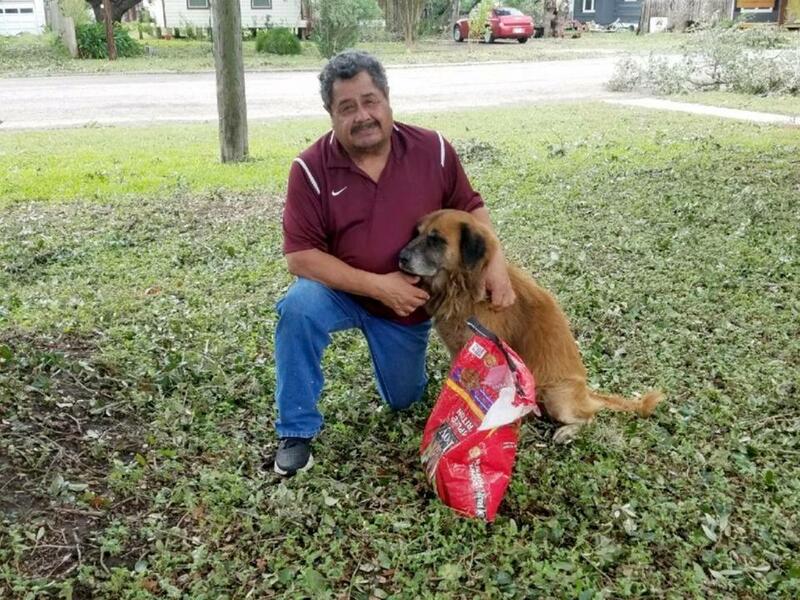 Just before the storm Harvey hit Texas’s southeast coast, Salvador Segovia left his grandson’s dog, Otis, in his home’s screened-in back porch, along with food and water. But the storm must have scared Otis, so he busted open the screen door and ran away on Friday night. Meanwhile, Tiele Dockens was on her way to check on the houses of some friends and families who had evacuated, when something caught her attention. A dog was walking down a street carrying a big bag of dog food. So she took a picture and shared it on her Facebook page. The photo quickly became viral, and the dog from Stinton, Texas, a town not far from Corpus Christi, is now an online celebrity. Dockens said the dog seemed familiar. In a small town of about 5,000 people, she said it’s likely that she has seen him before. As she followed the dog to make sure he wasn’t lost, she ended up outside Segovia’s house. Wet and muggy, the brown German shepherd mix with a dark snout and slightly droopy ears walked up to the front porch, set down the bag of food, and lay on the floor, Segovia said. Otis was a local celebrity in Stinton long before he became a viral sensation. Everywhere Otis went — at the county courthouse, local antique shops, H-E-B Grocery — everybody seems to know him. And people always feed him. ‘‘He’s got a real sad-looking face and people just admire him whenever they see him,’’ Segovia said. Otis also likes to take off alone, and he knows his way around town. Sometimes, he goes to the local Dairy Queen, where someone gives him some ice cream or hamburger, Segovia said. He also likes to stop by a local lumber and building supply store that sells dog food. The owners always feed him. Segovia said Otis might have walked over to the lumber store before he was found Saturday morning. He thinks Otis somehow got inside and grabbed a bag of Ol’ Roy dog food. Segovia said he had been watching Otis for his 5-year-old grandson, Carter, who left Stinton with his parents to escape the storm. Otis is probably about 6 years old, Segovia said. He found the dog when he was just a puppy. A man who was driving around stopped by one day, and said he was planning to just leave the dog somewhere, unless Segovia wanted it.